New Writers UK & New Writers Overseas: The Book Show (Talk Radio Europe). Interview with the author, Neale James. The Book Show (Talk Radio Europe). Interview with the author, Neale James. Hannah Murray: Welcome back to today's Book Show. Joining us on the line now from the UK is Neal James. He's been an accountant for over thirty years, but got into writing after entering a short story competition in 2007. His third book, his most complex work to date, is a gripping detective thriller called Two Little Dicky Birds. Welcome to the show, Neal. Neal James: Good afternoon, Hannah. HM: Thanks for joining us today. Now, I mentioned that you entered this short story competition in 2007. What made you enter it in the first place? NJ: It was something that I'd been toying with for a while. My wife picked up something in the local Derby Telegraph. It wasn't sponsored by the Telegraph, but it was a site that had taken up space in the Telegraph, and they were asking for entries. Maximum of five stories, maximum word length 2000 words, and I thought, well, why not? HM: And how did you decide what to write about? NJ: I didn't. I wrote five stories. I thought, five stories, different genres, see what happens. And one of them made it into the top ten. HM: Which was the story that made it into the top ten then? NJ: It's Chance of a Lifetime, which is in the Short Stories Volume One. HM: And what was it about? NJ: It's a brother and sister, cat and dog. Parents dead, she's in control of the company, he's just taking money out of the company as and when he wants, and she wants to get back at him. And the idea, he wins the lottery, yet he doesn't win the lottery, and he's made a fool of in front of all his friends. So she tapes the lottery, gets a birthday party organised for him, plays that week's lottery the week after, having bought the identical numbers on the ticket, and gives him the ticket as a present. NJ: He goes absolutely loopy, thinks he's won, and when she tells him, that's the joke. What she doesn't realise is those numbers crop up again. NJ: And she's already burnt the ticket. HM: Oh no, how awful! NJ: That's the twist in the tale. HM: Yeah, great idea for a story though. So, how did you go from short stories to writing your first book, A Ticket to Tewkesbury? NJ: That was a short story in itself. It was centred on the love story between Madeline Colson and Roger Fretwell, and a letter found by Julie Martin in her Aunt Molly's bag after the woman had died. Never been posted, goes back to the late Forties, and it's basically saying 'I love you, come and live in the South West.' But it never gets posted. Julie finds it, and thinks, 'I wonder, are they still alive?' and it goes from there. The idea of the story was she reunites two people, and they sail away into the sunset. But I got to the end of it and thought, 'What if Roger Fretwell brought something back from Europe? Something so secret, so powerful, that people would kill to get hold of it?' And the story went from there. HM: So this book, Two Little Dicky Birds, is actually your first full length novel then? NJ: No. A Ticket to Tewkesbury was first to be published, but the second one to be actually written. 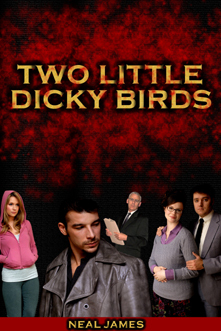 Dicky Birds was the first one to be written, but it's the second one to be published. It's a little bit back-to-front. HM: So, tell us about this latest one then. NJ: 88,000 words, the chase for a serial killer. Two timescales, 1975 to about 1992, and then present day, which is pitched at 2002. The serial killer re-emerges, and threatens a new campaign and gives the Met 28 days to catch him. And away it goes. And you'll have seen the little grid on the chapters marking down the 28 days to day zero, and that controls the current line in the plot. The rest of it is kind of a series of flashbacks to 1975, when Paul Townley kills his father in a fit of rage, and the story rolls on from there. HM: And where did you get the idea from for this story? NJ: Basically I wanted to see if I could write a detective thriller, but I was unsure of the background of where to pitch it. Being a football fan, I thought, 'Hang on a minute, I've watched Field of Dreams.' And this is no more a book about football than Field of Dreams was about baseball, so using the rail network to carry you up and down the country, hidden amongst thousands of football supporters, seemed to me to be an ideal blind to conceal a series of murders. HM: How long did the whole thing take? NJ: About nine months from planning it out using a spreadsheet, colour coded over four shades to make sure that each individual strand did actually tie back in at some point into the main plotline. HM: You're the first author I think I've interviewed who's spreadsheeted his plot. NJ: It's just second nature. HM: And colour coding and everything! NJ: It's the accountancy training. I'm afraid I'm a spreadsheet freak! HM: So, did it help, the spreadsheet? NJ: Yes. I've tried mind mapping, and things like that in the past, but they just don't work for me. A spreadsheet, I can look down on the screen, as I'm sitting here looking at the screen now, and I can think, 'Right, that's where I am. This is what he needs to do, then she needs to do that, then they need to do this.' Then we move down three chapters, and we can weave the plot, almost like a strand of DNA, in together. And it seemed to work beautifully with Two Little Dicky Birds. HM: So, can you ever change your mind? Can the spreadsheet go wrong? NJ: I mean, in Ticket to Tewkesbury, I had to be very careful with old people and young people, that I wasn't killing somebody off, and then having them say something two chapters later. So I had to spreadsheet a family tree, and colour code births, marriages and deaths, and the deaths were all blotted out in black, quite appropriately! So, you meet a black mark, and you can't use that character again. So, some things do go wrong. This is where Rob Eldridge popped up. He's my editor. Rob is... merciless with his editing. He'll say, 'Hang on a minute, Phil. Are you sure you want to do that? Because this character isn't actually in the country at the time.' And this is the kind of guy he is. He will take all the things I've written to pieces, and put them back together and say, 'Right. That now fits with that.' You get so close to something, and you can't see what's wrong. NJ: Now this is one of the dangers. And Rob's absolutely brilliant. HM: So, your name. Why have you used the pen name Neal James? NJ: Because Philip Neale is an accountant. Always has been, always will be. And accountants don't write books. NJ: Neal James is the reversal of my son’s name. NJ: And he's expecting a commission………I don't think so. HM: So, what's next for you? Have you started on another book? NJ: Well, the next one, and the book cover's being designed, is called Threads of Deceit. Just needs a final editing. And the designer is a guy called Dennis Eldridge, who is a professional photographer. The one after that is Full Marks. This is Dennis Marks, my stock detective. He's under investigation. All kinds of things being suggested about his character and his professional abilities. And it's how he gets out of it. And he's tied in with a guy called George Watkinson, who pops up in Ticket to Tewkesbury. So we're pulling characters in from two of the books I've already written. And that one, Rob's got that for editing at the moment. So we'll get that back after Christmas. And then we roll on to other books like Day of The Phoenix, which is a sequel to Ticket to Tewkesbury. I'm writing that at the moment. And that will pick up at the end of Ticket to Tewkesbury and drive the plot forward to 2010. So we're going to be covering eight years there, up to the General Election. Oops, I gave the plot away, didn't I?! HM: So you're very busy then! I mean, do you ever get confused where you are, and with which characters? NJ: No. I've got a science fiction novel of which I've written three chapter – it’s called ‘The Rings of Darelius’. I've dropped that one now, that's on the back burner, and I won't pick it up again until there's time. So, ‘Day of The Phoenix’ is the one at the front at the moment. HM: I can't believe I just asked you if you got confused when you have spreadsheets of things [so] you don't get confused. NJ: Oh, they are, you can have errors in spreadsheets. Don't ever run away with the fact that spreadsheets are perfect. They're not! NJ: But an idea popped up the other day for another book, and I've done the schematic on that. It's called Dreamer. What happens if you could dream, and the dreams came true? And you could control those dreams? That one's scary, isn't it? HM: Mmm. Some people would say that's true. NJ: It's kind of prophetic, but the dreams only come true if you tell somebody about them. NJ: So, it's going to be centred on a little boy, who doesn't realise his power. And nobody realises his power until he gets into his teens, then certain people in certain governments realise he has a power that they can use. It's going to get very, very nasty and complicated. NJ: And that's another genre I'm sort of shooting off into. HM: I was going to say, would you experiment with other genres? NJ: Yes. I mean the short stories cover all kinds of stuff, like crime, drama, adventure, fantasy, sci-fi, horror, humour. Particularly my DIY disasters at home. Our cats. I write about our cats. Anything that can turn a story. I was stuck one night, and I said to my daughter, 'Give me a title for a story.' She said, 'Stick. Write a story about a piece of wood.' I did, but it wasn't about a piece of wood. It was about an old guy looking for revenge in East London for the murder of his father in the Battle of Cable Street. And he was a cripple. And he had a series of sticks. Hence they called him Stick. HM: Ahh, I see. So you can make a story out of anything, you reckon? NJ: I could have a shot. I wouldn't say that I could do a story out of anything! But yes, it's fun. HM: Well, if listeners want to find out more information about you and all your books and stories, they can have a look on your website. It's nealjames.webs.com. There's a link on our website as well. And if they want to get a copy of your latest book, it's called Two Little Dicky Birds, and it's available to buy on our website. Neal James, thank you very much for joining us. NJ: You're very welcome Hannah. Thank you very much indeed.